Western Whiskey Gazette (WWG): #202 WHAT? Never say never. And it couldn't ring truer here. Western Whiskey Bottles 4th edition, Page 50 & 51. #202. Crown Distilleries / crown and shield / Company. Pint and fifth. Ca. 1901 - 1911. Shades of ambers ranging from orange and yellow to dirt clod brown. Normally neat like it was blown yesterday with a tidy tooled inside thread closure top. Not a bottle to get excited about, ever. That was until today. Part of another collection rolled in and I about fell off my chair when I unwrapped this critter. PCGW base mark. Yea, big deal. But a drippy applied top? What'd they do, have grandpas day at the glassworks and bring in a few retirees for old times sake? I still wonder how many mold variants Crown really made. 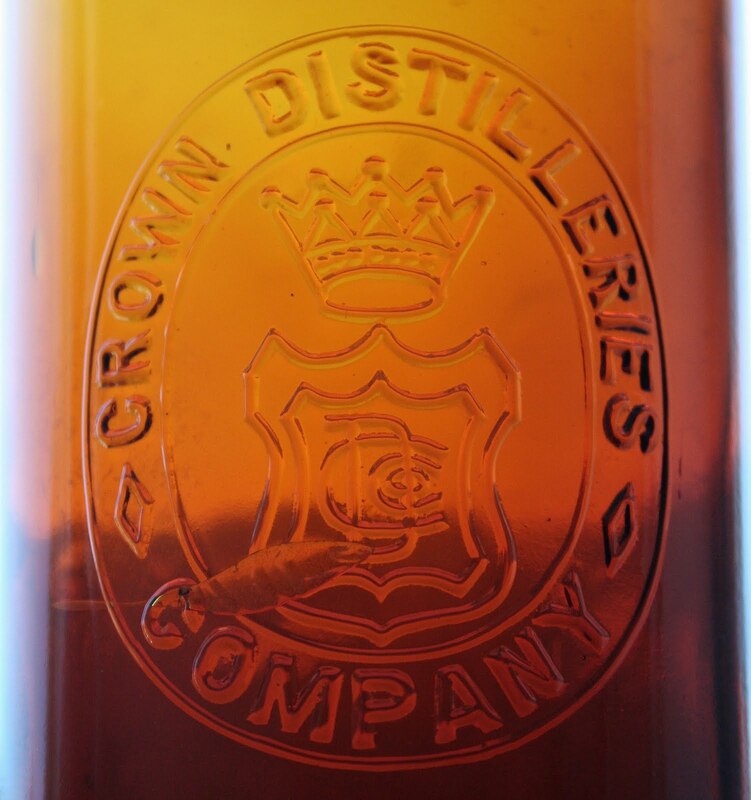 As you probably don't know, Crown actually began production in 1894 (not 1895 as noted in some of the books). I went through a dozen of my Crowns and found one that matches yours except for a slight difference in the top, could be in the quality control of the manufacture. Both are base embossed as they were made in San Francisco at "P G Co". 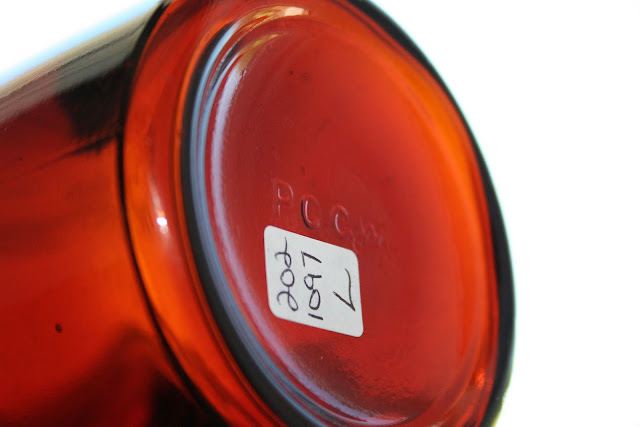 Most Crowns aren't base embossed, but a few are embossed with "P C G W". The key to this variant (yours) is in the crown itself, which has an oval base with its band containing 7 dots, seated very close to top of the shield. A similar variant with 7 dots, has a flattened bottom rather than the rounded oval as above and also has a neatly applied top, with no base embossing. I went through several of mine that are drip tops, but their embossings are quite different. I Don't have all of my Crowns unpacked yet and don't recall all except those with lots of character like the whittled drip top varieties. At one time I think I counted over two dozen variants. What I thought was fun, was to find an example of an Inside Thread top with its matching Cork top, but I have a few Cork tops, which is reasonable as the big advertising campaign for Crown was its IS thread closure for security. The best I can tell is that the inside thread closure began in or about 1892 by Lilienthal. If you run across a Crown with a Lilienthal IS stopper, Crown was using them also at least through 1906 until their supply ran out (I found many at my in laws mining camp in southern Nevada in the mid 1960's, which dated to 1906). I am guilty of not paying close enough attention to those bottles. No, I have not seen one, but honestly never looked.